Rinascimento or Instauratio: where to focus? Disunited Italy. 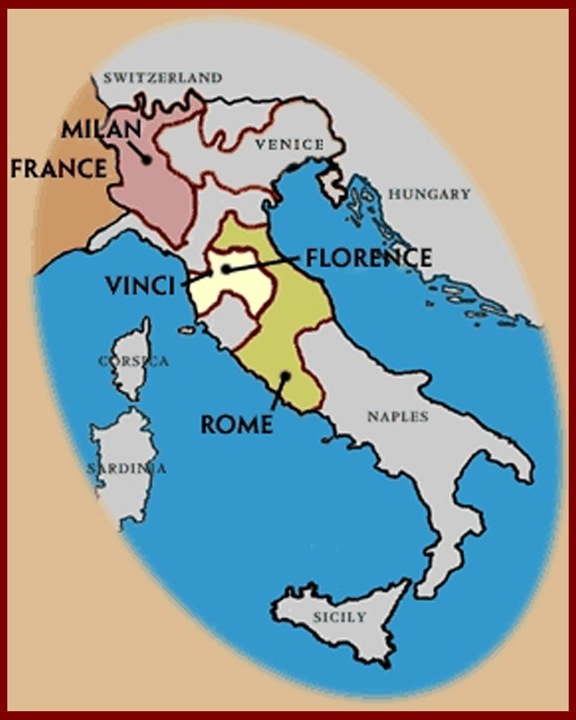 Borders shifted occasionally, but for the most part this was the way the Italian peninsula existed during the middle centuries of the second millennium AD. Before there was a rinascimento (Renaissance) there was an instauratio (restoration) -- or at least a sentiment toward instauratio. Rinascimento was a Florentine invention -- Giorgio Vasari coined the usage. Instauratio was first of all a Roman concept that originally referred to the desire to return the popes, who were resident in Avignon, to their chair in Rome. A corollary of that return was the reaffirmation of their authority, power, and perquisites. The papal party and its allies, of course, would define it all, and it, naturally, included the dignities of the Roman emperors as well as those of the early popes. Just as importantly, it was necessary to restore the grandeur of Rome -- arts, architecture, literature, sciences -- which would make the popes' restoration both possible and comfortable.